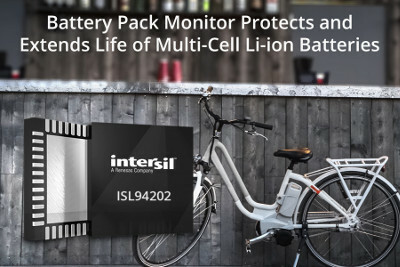 Intersil has released the ISL94202 3-to-8 cell battery pack monitor that supports lithium-ion (Li-ion) and other battery chemistries used in applications such as vacuum cleaners, lawn equipment, handheld power tools, e-bikes, scooters, toys, and energy storage systems. Li-ion batteries are smaller, weigh less, and deliver longer battery life than other battery chemistries, but require monitoring and protection for safe use. The highly integrated ISL94202 battery pack monitor enables ultra-small 2-terminal designs, and accurately monitors, protects and cell balances rechargeable battery packs to ensure safe operation and charging. The ISL94202 operates as a stand-alone battery protection system using an internal state machine with five pre-programmed modes for accurately balancing and controlling each battery cell. It monitors and protects the battery pack from catastrophic events such as hardware faults, short circuit conditions, and cell voltage overcharge/over-discharge and meets the UL2054, UL2271/72 and IEC62133 specified pack safety requirements. Designers can program the ISL94202 battery monitor's protection settings to enable the industry's smallest, low-cost battery packs without requiring an external microcontroller. If required, the ISL94202 can also communicate with an external microcontroller via I2C serial bus to provide additional fuel gauge measurements, including state of charge and state of health information. Precise fuel gauge status is provided by the device's high-side current measurement feature. The ISL94202 integrates high-side charge/discharge FET drive circuitry, which makes it easy to interface to tools or electric motor equipment. The device also controls external passive cell balancing switches to ensure good cell energy matching while protecting the pack's cell life from chronic undercharging. In addition, the ISL94202 can withstand factory pack assembly hot plug events, which greatly simplifies manufacturing. The ISL94202 battery monitor is pin-compatible with the popular ISL94203 device that supports separate charge/discharge paths for higher-end 3-terminal battery packs. They are both part of Intersil's family of industrial battery management solutions, including the ISL94208 4-to-6 cell Li-ion battery management analog front end, and ISL94212 Li-ion battery manager IC, which supervises up to 12 series connected cells, and is cascadable up to 14 devices or 168 cells. The company's Web site address is www.intersil.com.